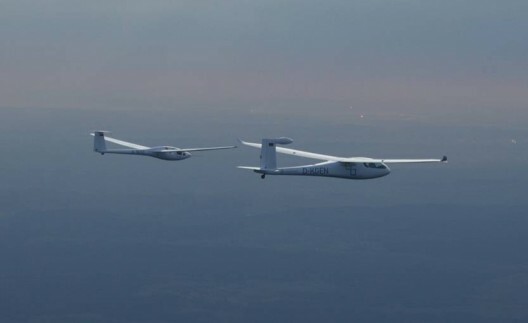 At this year’s Electric Aircraft Symposium, Rudolf Voit Nitschmann, Len Schumann, and Ingmar Geiss shared their well-documented experiences with e-Genius, second place winner in 2011’s Green Flight Challenge. Flown by Erik Raymond and Klauss Ohlmann, the airplane managed 397.5 passenger miles per gallon on its 200-mile trek around a closed circuit between Santa Rosa, California and the distant geothermal power plants that provided the electricity for its flight. As Voit Nitschmann, leader of the e-Genius team since 2005 noted, one must design electric aircraft around the beneficial aspects of such vehicles to gain the greatest performance. Originally slated to be hydrogen powered, e-Genius mounts its 59-pound motor on the leading edge of the vertical rudder, more difficult with a heavier internal-combustion engine. This permits ample propeller clearance, provides blade protection and allows a short, retractable landing gear that is light and simple. With no turbulent flow over the nose, the cockpit can be streamlined like that of a sailplane and obtain that level of cleanness. These benefits are spelled out in the e-Genius web site and demonstrated quite well in this video from the 2012 Berlin ILA airshow. Compared to a conventional touring motor glider a substantial larger propeller-diameter can be realized without a high and consequentially heavier undercarriage. Therefore the propeller-efficiency will increase. The front body part has the aerodynamic quality of a modern glider (no vorticities and local impact pressure peaks) and thus a very small drag. The propeller is optimally protected from ground contact. Dipl.-Ing. Schumann, followed those trends in developing the basic concept of the Hydrogenius in his diploma thesis in 2005. Today with Dipl.-Ing. Geiss, he is one of the two deputy managers of the project and coordinates the further development of the aircraft. Recent tests helped characterize the airplane’s performance, with careful measurements with flaps at a negative five degrees, and the airplane flying at different propeller and throttle settings. Such tests, including zero thrust glides, allowed verifying efficiencies, operation and durability of batteries, motor, controller, propeller and total system integration. Validation of an extremely low drag coefficient without its propeller came in a head-to-head comparison with a well-calibrated (“holy”) Glaser-Dirks DG-300, a respected competition sailplane. The already-slim nacelle was modified slightly to remove any drag that would come from the propeller openings in the spinner. It demonstrated a sink rate of less than two feet per second, matching the DG-300’s performance at various speeds, as shown in the video. Voit Nitschmann concluded with a look at future plans, which will include the integration of a 30 kilowatt range-extender engine. He explained that this would still enable performance in the 200-plus passenger miles per gallon range, certain to be a hit in an era of $6.00 per gallon gasoline. That would mean two people going 100 miles an hour (roughly GFC speed) would use only one precious gallon of fuel, much better than conventional light aircraft. A fully-loaded Cessna 172, by comparison only gets about 40 pmpg. Because it’s being tested thoroughly, Stuttgart’s GFC flier can become a touchstone against which to measure performance for future designs. Along with Pipistrel’s G4, it marks a new path which future craft may follow.